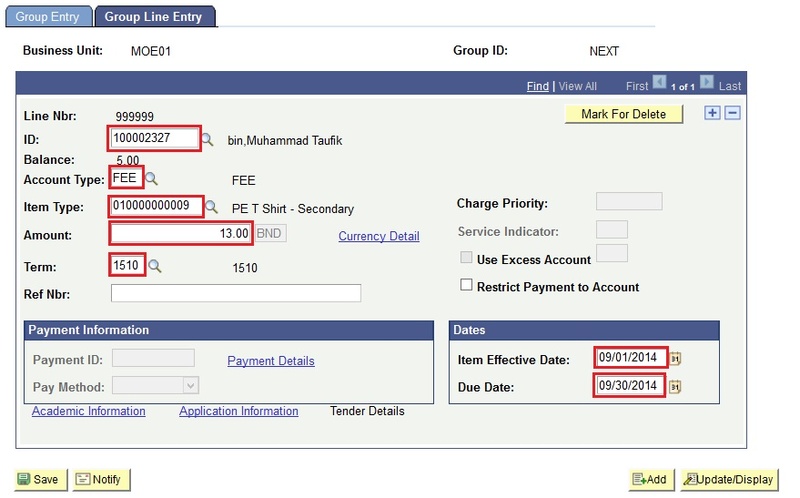 This function allows the users to post fees not posted by the Tuition Calcuation process (Automatic Fee Calculation), like PE T-Shirt, CCA Fund etc, to the student's account. Fees can be posted for individual students or for a group of students. Fees needs to be approved by the Principal or Head of Department (HOD) before it can be posted to the student's account. 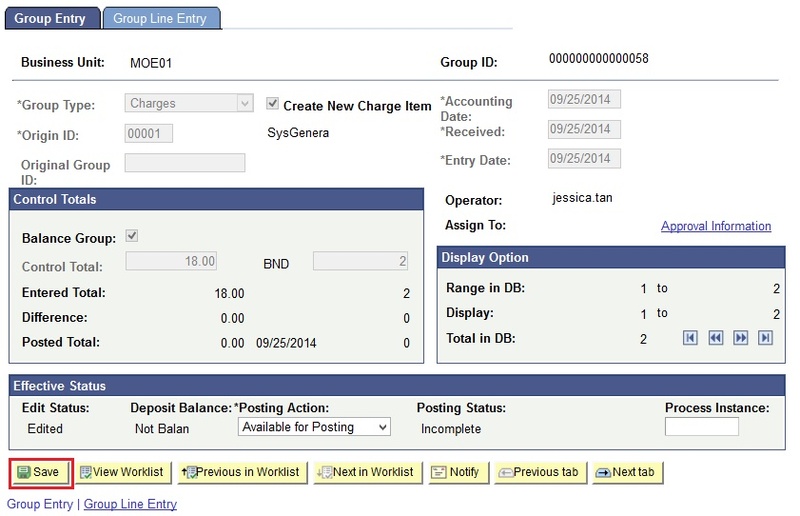 This function will be used to create a group with details of the student as well as the charges. This group will be sent for approval by the principal before it can be posted. 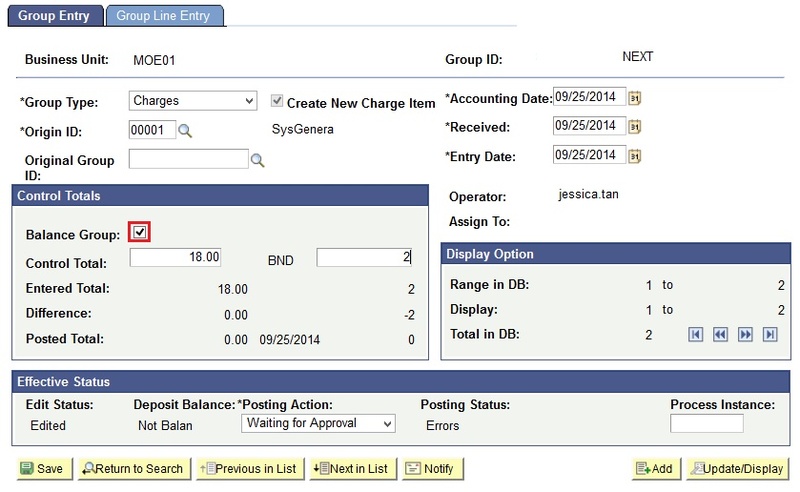 Navigate to Main Menu > Student Financials > Charges and Payments > Group Processing > Create Group Data Entries. 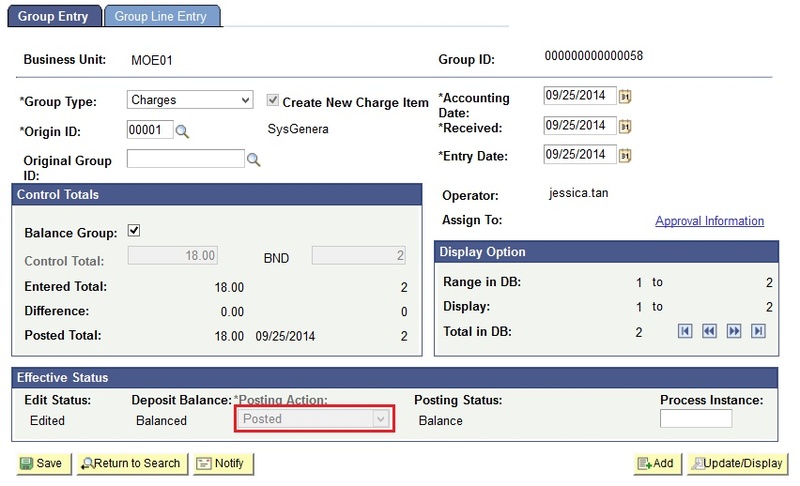 In the Add a New Value tab, enter the Business Unit. Note: Group ID is a unique running sequence number. It will be automatically generated by the system based on the last Group ID generated. You will be directed to the Group Entry page. In the Group Entry tab, enter values in the Group Type and Origin ID fields. Note: Group Type is used to classify the group created and Origin ID is to identify where the charges originated from. 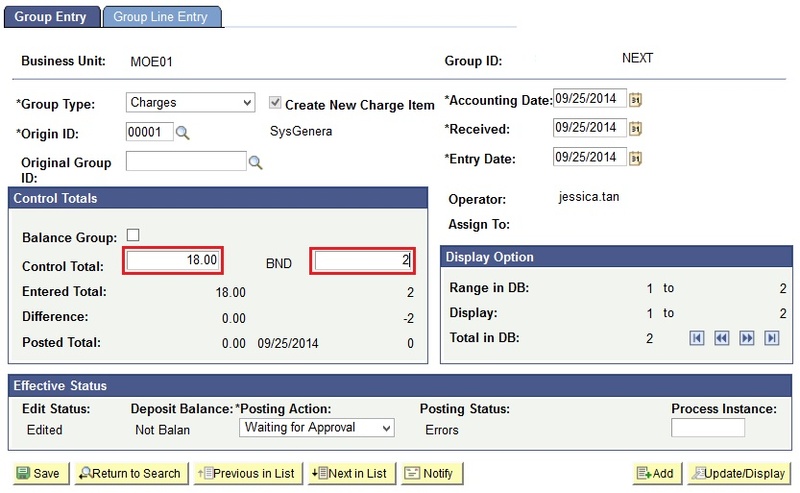 In the Group Line Entry tab, enter the values in the ID, Account Type, Item Type, Amount, Term, Item Effective Date and Due Date fields. Note: When selecting the Item Type, ensure that you select the item type according to the level of the student. E.g. If the student is a primary school student, select item types for primary school. If the student is a secondary school student, select the item types for secondary schools etc. 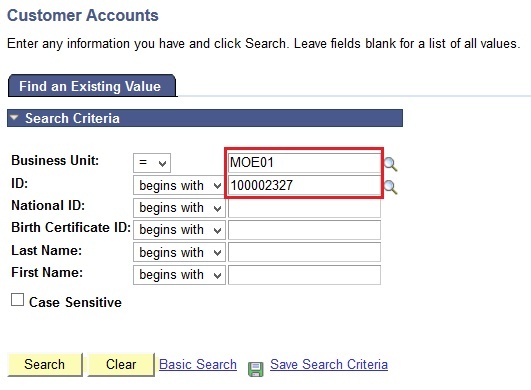 Click the '+' button if want to add another student record. Note: A new row will be added. All data entered previously will be copied over. You can change the values if required. 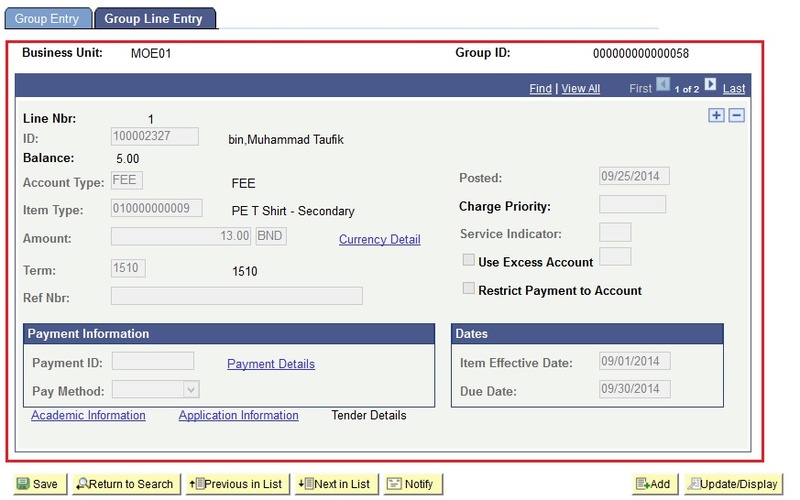 Do not add charge and payment transactions in the same group. Click back the Group Entry tab. 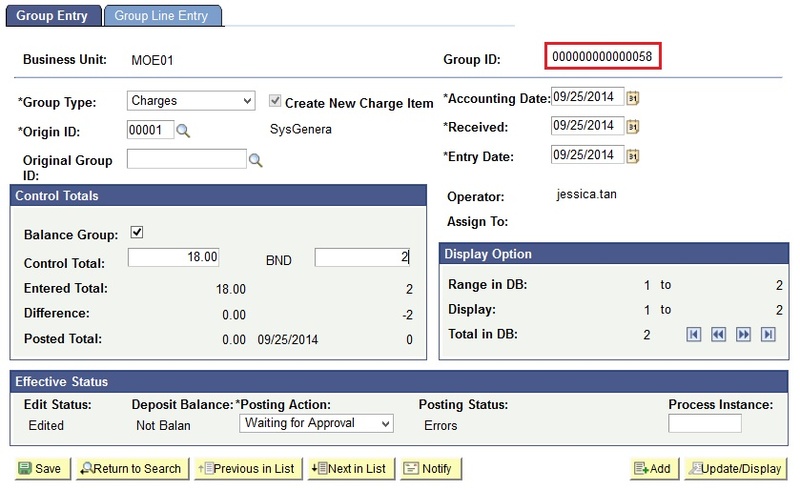 On the Group Entry tab under Control Totals scroll, enter the total amount entered for the group in the Control Total amount field and total number of rows entered for the group in the Control Total count field. 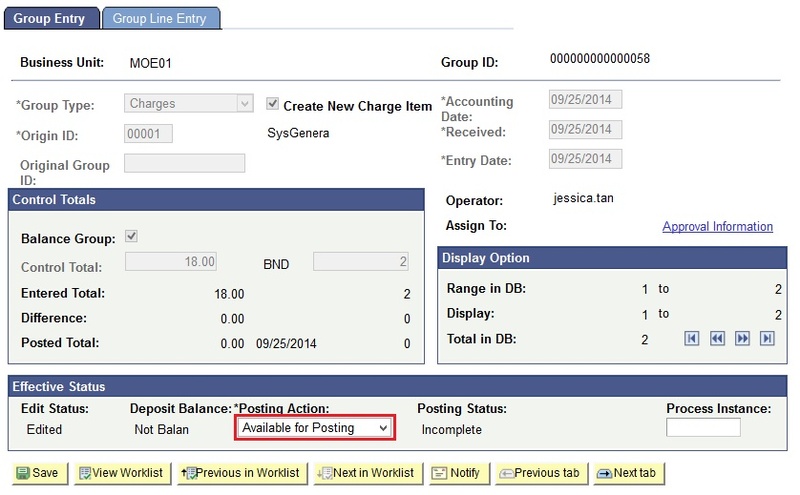 Tick the Balance Group checkbox. Ensure that the Posting Action is 'Waiting for Approval'. The group have been routed to the principal for approval. Take note of the Group ID generated. Note: Inform the principal of the Group ID generated so that they know which group needs to be approved. This function will be used by the Principal to approve / deny the group after it has been created. Navigate to Main Menu > Worklist. Look for the Group ID number to find the group. Note: Worklist shows all the items that are pending approval. Verify the data in the Group Line Entry tab. Note: Review the data entered into the page and ensure all posting information is correct. On the Group Entry page, change the Posting Action to Available for Posting. Change the posting action to Do Not Post if you do not wish to approve the group. Click the Save button, and the group will be approved. This function allows the Class Teacher / Finance Officer to post the group once it is approved by the school Principal. Navigate to Main Menu > Student Financials > Charges and Payments > Group Processing > Post Transactions. 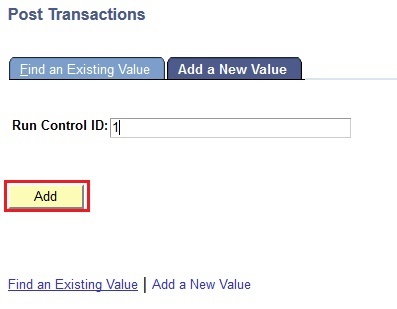 In the Add a New Value tab, enter any value in the Run Control ID field and click the Add button after that. Note: Any value can be entered as the Run Control ID and can be retrieved later. You will be directed to the Post Transaction page. 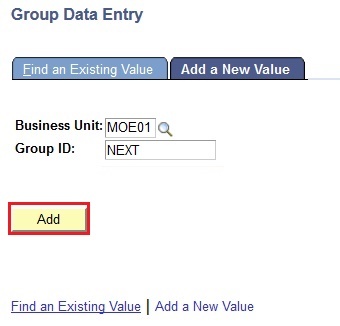 Enter the values in the Business Unit, Group Type, Starting Group ID and Ending Group ID fields. Note: Ensure that the Group Type is the same as the Group Type of the Group created. 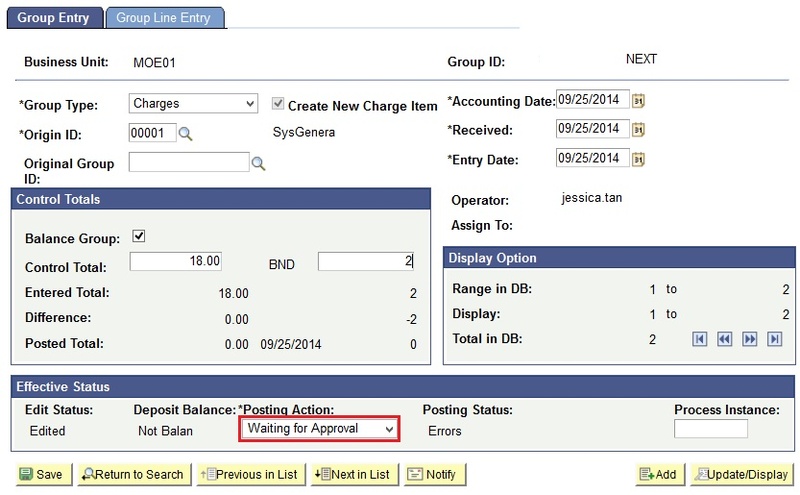 Click on the Run button and user will be directed to the Process Scheduler Request page. Select the 'Group Posting Process' and click the OK button next. Take note of the Process Instance number. Click on the Process Monitor link and user will be directed to the Process Monitor page. Use the Process Instance number to look for the process and click the Refresh button until the Run Status is Success and Distribution Status is Posted. Once the process has completed, check for the status of the group in the Create Group Data Entries page. 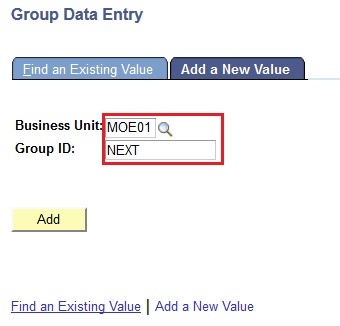 In the Find an Existing Value tab, enter the values in the Business Unit and the Group ID. Note: The magnifying glass can be used to search for the Group ID. Ensure that the Posting Action is Posted and there are no errors on the page. 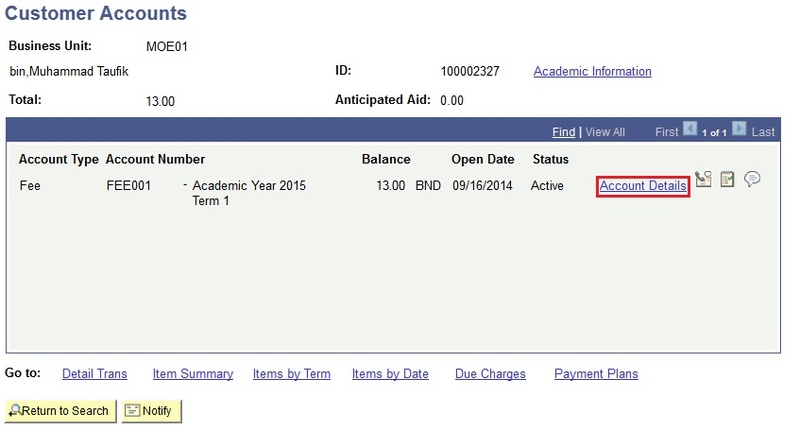 Fees have been successfully posted to the student's account. 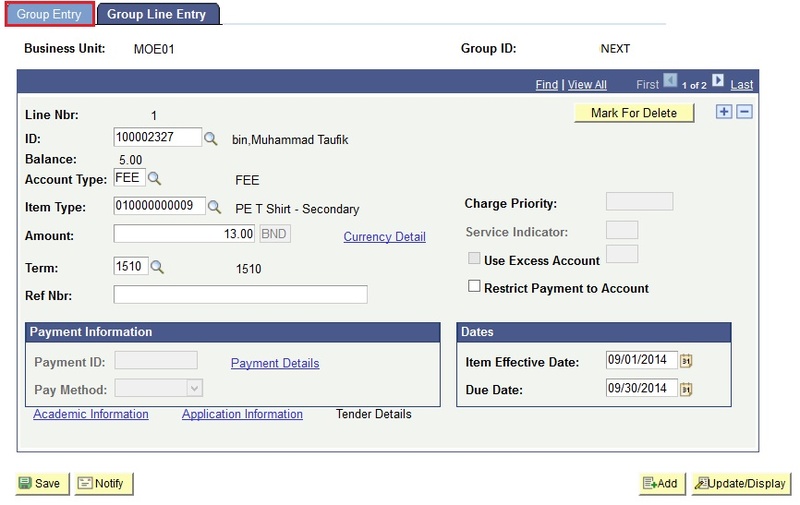 Once the fees is posted, the Class Teacher can verify the fees posted to the student account. 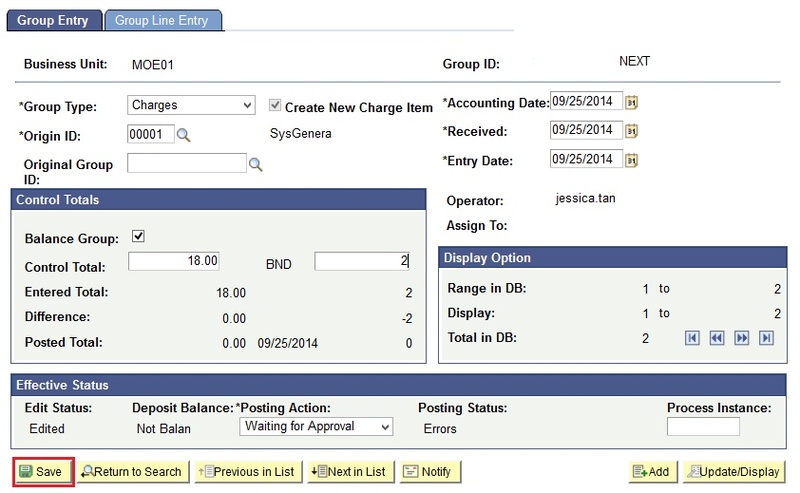 Navigate to Main Menu > Student Financials > View Customer Accounts. 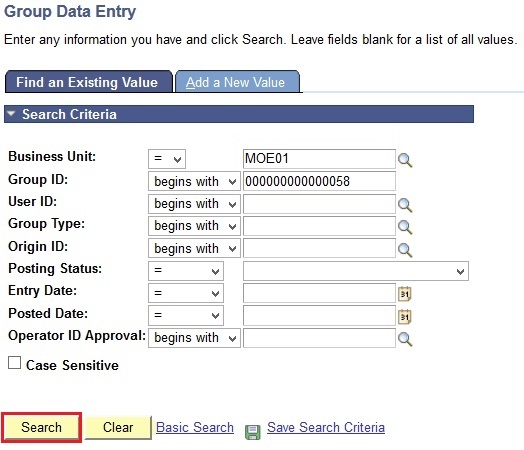 In the Find an Existing Value tab, enter the values in the Business Unit and Student ID field. Note: The magnifying glass can be used to search for the student. 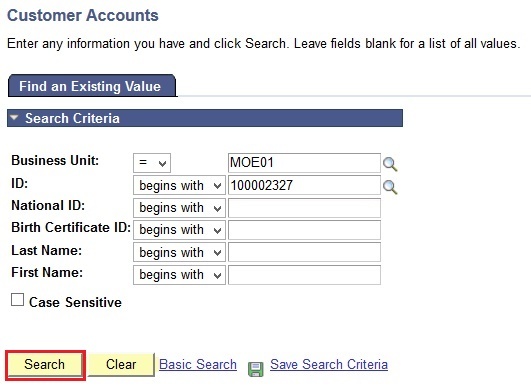 Click on the Search button next to search for the student account. Note: The Customer Account will display all charges and payments posted in the student's account. Click the Account Details link to view all the transactions posted in that term. 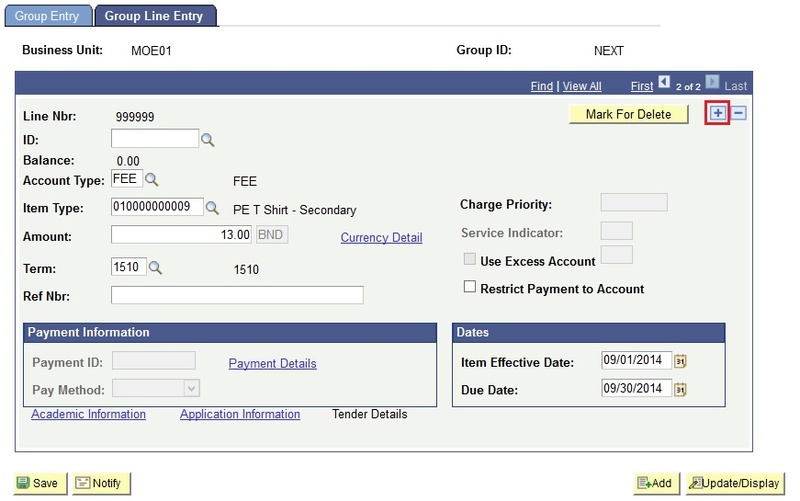 Click on the Item Details link to view the details of the transaction like Due Date and Item Type. The fees that is charged to the student will be shown.